Cycling in the Lake District on the South American Epic, Henry Gold gives us his first post. It is never easy to describe the appeal of TDA tours. Take today, a ride from Chanco to San Nicholas, a 143km ride with an elevation gain of just over 2,000m, significant section of the road under construction, forcing the riders into a detour on dirt road and climbs of 15% gradient or more. This being southern Chile, there is always wind to contend with. Add to this, the original lodging in town did not work out and Cris – the intrepid leader – was in urgent search to find accommodation for a group of 47 people, with no hotels in town. So it would be a good assumption that tonight the riders will not be a happy bunch. While Cris was looking for a place, a Brazilian woman living in San Nicholas recognized his vehicle licence plate (from Brazil), after which a long discussion ensued ending with an offer; “let me know if you need anything” – pointing her finger to her home with a full kitchen. As Cris ran around looking for a place, a man who owned a tire shop offered his farm just outside of town: “I have a big field and you can camp there.” Cris and the owner went to take a quick look. A decision was made. The farm on a small hill facing some of the highest Andean peaks with the light reflecting from the snow in the distance would have to do. An impromptu outdoor shower was set up, the dinner truck arrived unloaded and started preparing dinner. Once back in town the first racers arrived worn out and hungry. Being Sunday and fiesta time, everything was closed. So Cris headed to the Brazilian woman who immediately started cooking food. Soon enough the racers were not only fed but showered and enjoying the hospitality. It took them over three hours before they decided to make their way to the campsite. In the meantime, other riders were arriving at the farm where Carlos and his son Carlos have returned from shopping and brought soft drinks and beers for the riders. One by one tired riders arrived and somehow the lack of facilities seemed not to matter. What mattered was the simple things: a wide field covered with flowers, a beautiful view of the Andes, the open-hearted welcome by the owner, and the camaraderie that comes along when a group experiences something unique. After dinner of barbecue chicken, salads and rice, the riders were sitting on Carlos’ veranda, exchanging ideas, sipping drinks as the sunset hit the mountain peaks, and experiencing a general sense of a day well spent. 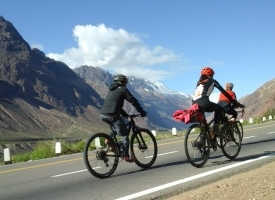 0 comments for "Just Another Day on the South American Epic"
Leave a comment for "Just Another Day on the South American Epic" by visiting the original post on our TDA Global Cycling blog.